Introduction: Course objective, scope of training, certification assessment content. 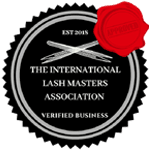 Description of tinting: Overview of eyelash and eyebrow tinting, products, equipment and techniques required to provide tinting services. Client Assessment Practices: Assessing the clients’ lashes and brows, assess and discuss options, eyelash and eyebrow colour choice and mixing of tint colours. Application Preparation: How to prepare to proceed the application for Tinting. Occupational health and safety, contraindications, client preparation, workstation preparation.